The night hides a world but reveals a universe. 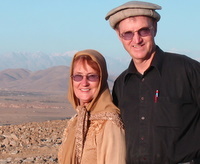 Grant Lock directed Afghanistan’s largest eye care program. Until he himself became blind. He returns home to a society with its own blind spots: myopic attitudes to Islam, mental health and what makes us human. After battling corruption, injustice and disadvantage in the deserts, mountains and cities of Pakistan and Afghanistan, Lock confronts challenges—both intimate and global—with courage and compassion. Riveting. To his experience in some of the world’s most troubled places, Lock brings a bushman’s wit and wisdom. Lock writes about Islam with authority and insight. Grant Lock is master of the ripping yarn. This smorgasbord of human experience spans centuries and continents and embraces themes common to us all: hostility and hospitality, disaster and hope, the mundane and the marvelous. Inspirational. I could sit in a pub all day listening to Grant Lock. 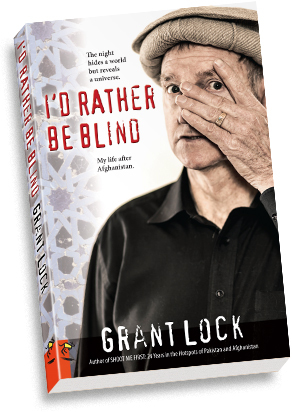 Grant Lock dug wells, built schools and helped restore the eyesight of thousands of Afghans. Grant is married to Janna, the woman the widows of Kabul call Frishta (Angel). Development work in Pakistan and Afghanistan followed their notable success as cattle breeders in South Australia. Download a sample chapter (PDF format). I'd Rather Be Blind can be purchased at Koorong. 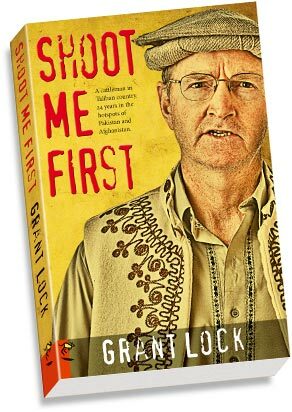 Email Grant Lock at grantlock@shootmefirst.com. Check out the Shoot Me First Facebook page! Sales advice from Grant Lock. Subtitle: The Night Hides a World but Reveals a Universe. My Life after Afghanistan. I'd Rather Be Blind is distributed throughout Australia by Dennis Jones & Associates. Unit 1 / 10 Melrich Road, Bayswater, Victoria. A cattleman in Taliban country. Twenty-four years in the hotspots of Pakistan and Afghanistan. Shoot Me First is a gripping personal account of life in Pakistan and Afghanistan. The author offers intriguing insights into the culture of the tribal territories that straddle the two countries. This is home to the Taliban, an untamed land which continues to absorb so much of the world’s attention and military endeavour. Lock is shrewd and laconic but above all compassionate. His experience of the world’s two major religions deserves careful consideration. Supporting micro-hydroelectric systems, empowering Afghan widows and overseeing a massive eye-care program, Grant and Janna Lock’s development work in Afghanistan and Pakistan followed their notable success as cattle breeders in South Australia. The stench of stale urine rises with the dust as my Pakistani workmen begin to demolish the building. Shovels and picks bear down on the mud bricks, clay rendering and poles. Sweat rolls down their faces, glistening in the sun. Time is up. The dukandar (shopkeeper) has had his chance to demolish it himself. Now I’m doing it for him, as quickly as I can, before there is trouble. I’m dimly aware of the noise of a crowd gathering in the street outside the mud walls of the derelict Pennell High School. This is Bannu, in Pakistan’s Pashtun country, near the border with Afghanistan. Back in the days of the British Raj, Dr Theodore Pennell built a school for boys and later added this segregated compound for girls. Neglected, and closed in recent times, we plan to open it again. It is a challenging region for an engrez (foreigner) to work in. Before too many years have passed, the eyes of the whole world will focus on the nearby rugged Tribal Area. The Taliban- and al-Qaeda-riddled mountains span this porous border of the Islamic Republics of Pakistan and Afghanistan. Pilotless drones will circle overhead while Islamic extremism oozes from its mountain fastness. As the Coalition tries to extricate its troops from the Taliban war, Afghanistan will be worried. The United States will be worried. Indeed, the entire world will be worried because the sting of an over-patronised Taliban scorpion will be curling back to strike its mentor, nuclear-loaded Pakistan. Now in 1992, however, as I watch the walls of the dukandar’s illegal storeroom come down, all I’m worried about is getting the job done despite any uncooperative locals. “Sir! Now! You must come now! They are very upset!” It’s Samson, my dedicated Pakistani assistant. Unlike the long-haired muscle man of Old Testament times, my Samson is frail and sickly. He stands barely as high as my shoulders. But his shrewd understanding of Pashtun ways has got me out of jams before. So what’s new? As with the naan bread and chai tea they survive on, Pashtuns and guns are synonymous. Pashtun boys are born with a gun in their hands. Pashtun courage and marksmanship when repelling invaders and settling feuds amongst each other are legendary. Pashtuns and guns, plus anger. I’d be a fool to ignore that nasty cocktail. I order the workmen to keep up the demolition. Dust from the collapsing clay roof fills the air as I march to the gate. It was hard enough to evict the squatters. We’re not stopping now. Stepping out of the compound, I can see that the influential shopkeepers have indeed stirred up an angry crowd. Mostly bearded, they are gesticulating and shouting in Pashtu. What’s all this about? They know their fellow shopkeeper illegally extended his storeroom into the school ground. They know that yesterday he signed a document admitting his fault. He agreed for us to remove the building if he failed to do it himself within twenty-four hours. Surely they know that we are re-opening Pennell’s school for their Muslim daughters as well as the minority Christian girls. Don’t they realise that this is for them? But the mob is defending the damaged honour of their colleague, who yesterday had to publicly admit his guilt to an unbelieving foreigner, a lowly kafir who stands with the small community of Pakistani Christians, the local kafirs. Hospitality, honour and revenge. That’s the age-old mantra of Pashtunwali, the unbreakable code of the Pashtuns. Looking into the black eyes of the shouting beards, I can see that in this dusty Bannu bazaar, honour and revenge have conveniently coalesced. The crowd falls silent, savouring the imminent back down of the engrez. The preservation of all-important male honour trumps female welfare every time. Anger and indignation surge up within me. Hey, you bellowing misogynists, this is for you. This is for your daughters, for the mothers of your grandchildren. They all hear it. The silence thunders in my ears. Crisp, beautiful and revealing. Valuable for anyone trying to build an appreciation of Islamic societies. And that should be all of us. Lock’s adventures are probed for meaning so that the reader may have a deeper comprehension of a region frequently in our headlines but seldom in our understanding. The raw reality of daily life for ordinary people, up close and personal. Lock gives the most pressing global issues of our time a human face. Your book brought back so many memories. I couldn't help but cry. Shoot Me First can be purchased in paperback and Kindle ebook format at Amazon, and at Koorong and Word bookshops in Australia. Also available in audio MP3 format on CD from Koorong. Subtitle: Twenty-four years in the hotspots of Pakistan and Afghanistan. Shoot Me First is distributed throughout Australia by Dennis Jones & Associates.